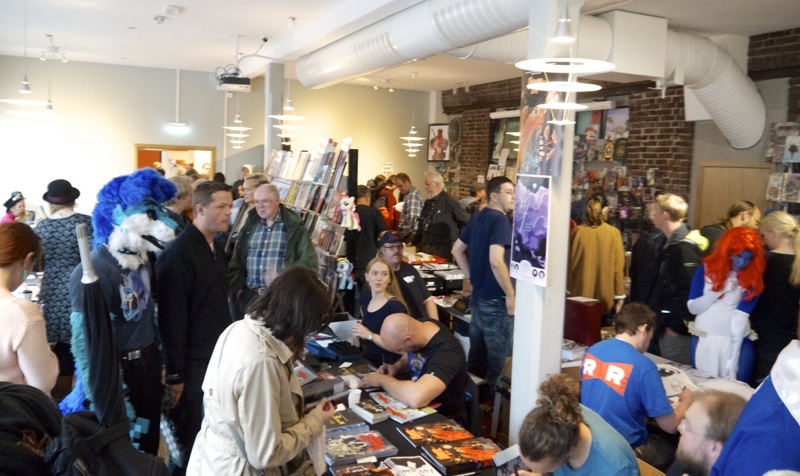 The Raptus International Comics Festival 2016 is currently taking place in Bergen, Norway. The festival, which this year is held from Friday 16th to Sunday 18th of September, is an annual highlight for comic readers, anime fans and creative people like artists and cosplayers… Just to mention a few. I’ve written about Raptus a few times before on this blog, and you can check out my previous posts here: 2011, 2012, 2013 part 1, 2013 part 2, 2014 part 1, 2014 part 2 and 2015. 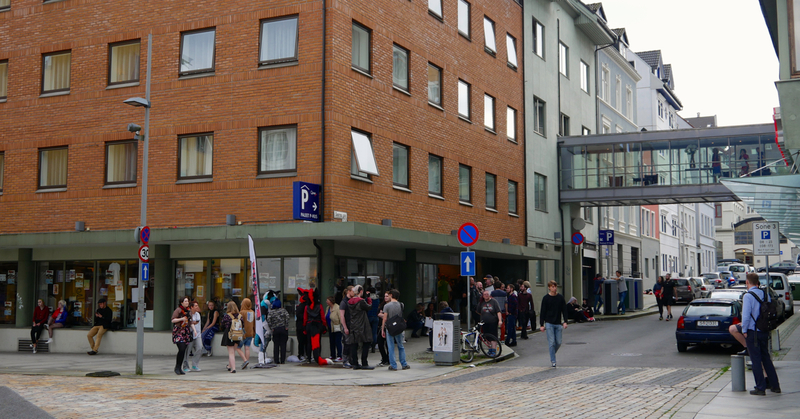 This time around, Raptus is being held at Scandic Bergen City hotel in the city centre. I went to two panels today (Saturday). 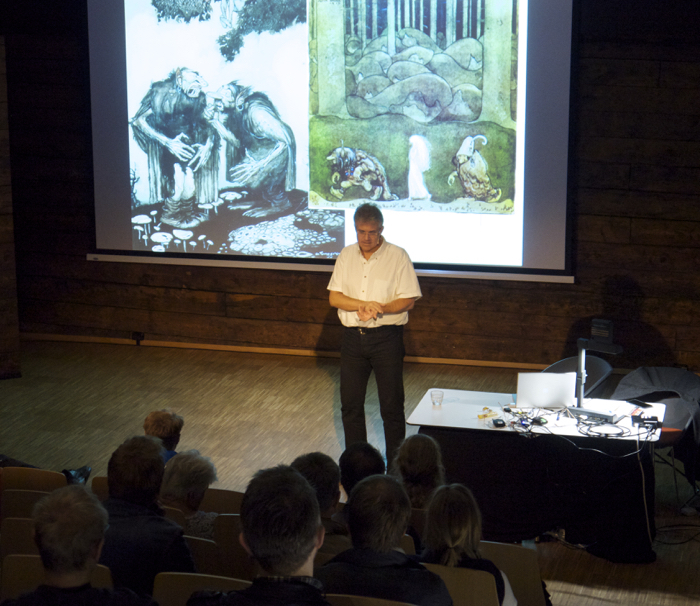 One was an interesting talk about drawing with nib pens and ink, held by Norwegian comic artist Tore S. Olsen (Instagram, website). 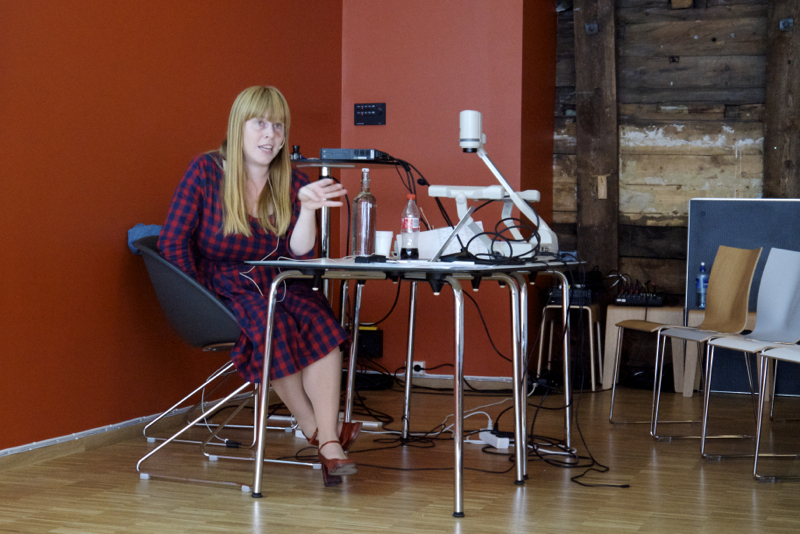 The other was more of an artist interview with Agnes Garbowska (Instagram), focusing on making comics, how she loves telling stories and how she got hired to make My Little Pony comics. 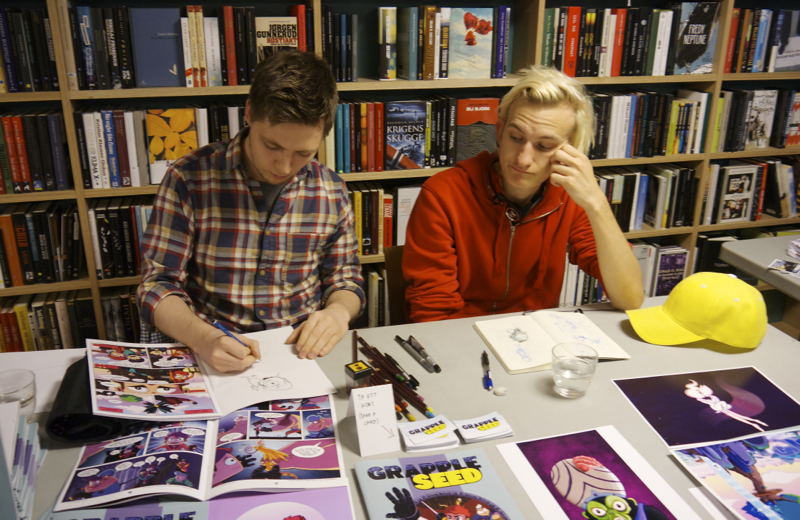 In past years, the festival itself would suffer from lack of space, particularly at the artist tables. The new venue seems to offer slightly more space for people to move about. On the downside, the exceptionally hot weather and lacking air circulation makes being inside a tad unpleasant. In turn, this makes the visitors hang out in the streets and open spaces outside of the venue. 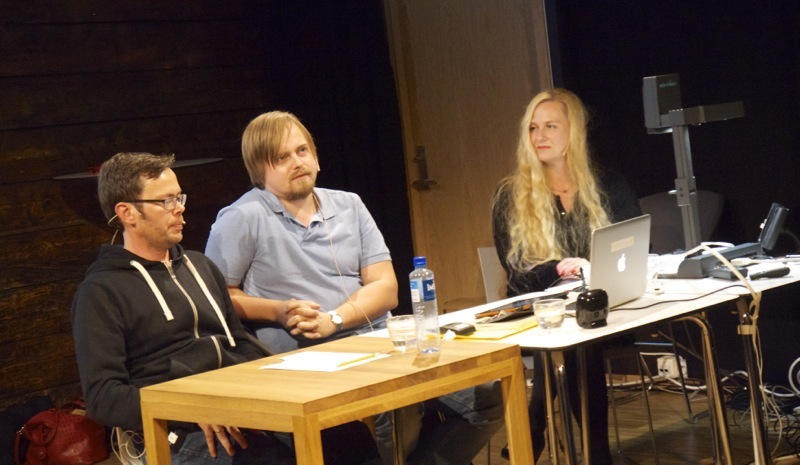 It’s worth mentioning that the three rooms reserved for talks and panel discussions are very nice, with nice chairs and lots of fresh air and light. Also, the staff and volunteers (and there are a lot of them) are very visible, cheerful and helpful, even bringing coffee and fresh drinking water to artists during panels. Some artists and visitors are posting updates from the festival on their social media accounts (check out Agnes Garbowska’s account on Instagram). I’ve borrowed this gem from the couple behind strekinstinkt.com (Instagram). PS: Can you tell that my favorite social media platform at the time is Instagram? I mean, I haven’t updated this blog in a year. But that doesn’t mean that I haven’t been meaning to get back to it… In the meantime, you can follow my Instagram. You can also send me a tweet @InvPaperclip. 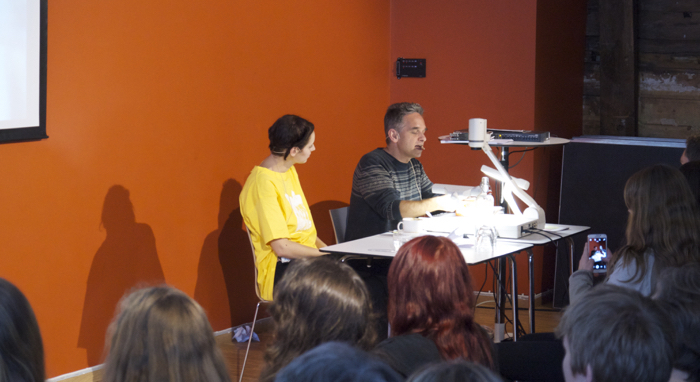 I visited the Raptus International Comics festival the during the weekend. 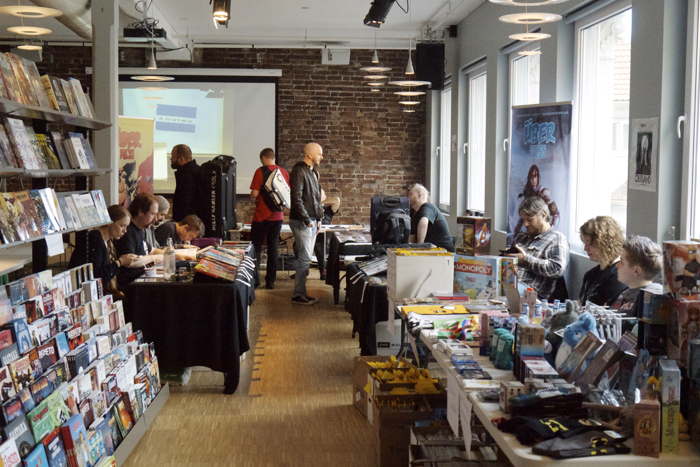 The comics festival, which this year was from Friday 18th to Sunday 20th, is an annual event that I have been going to for a few years now (links at the end of this post to previous write-ups!). I couldn’t attend the opening on Friday, but at least I got to spend a few hours at the venue on Saturday. 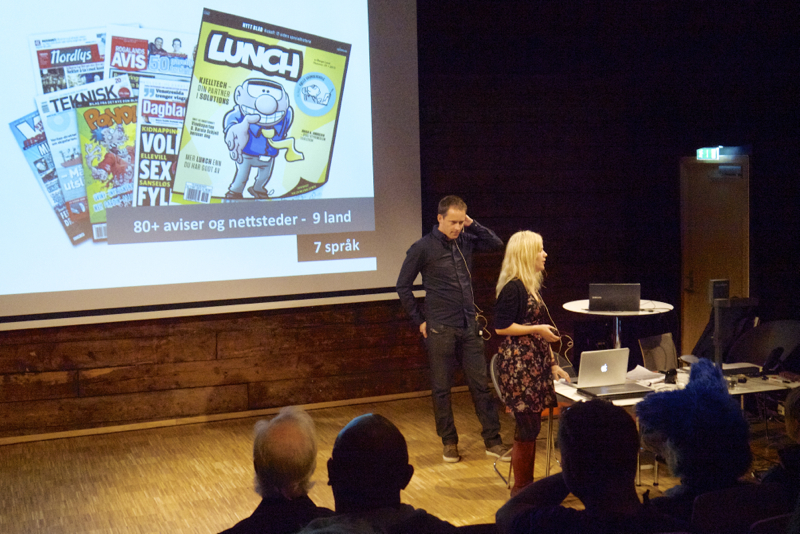 First of all, I attended a presentation on the upcoming Christmas comic Truls og Trine, hosted by the artist, Arild Midthun. 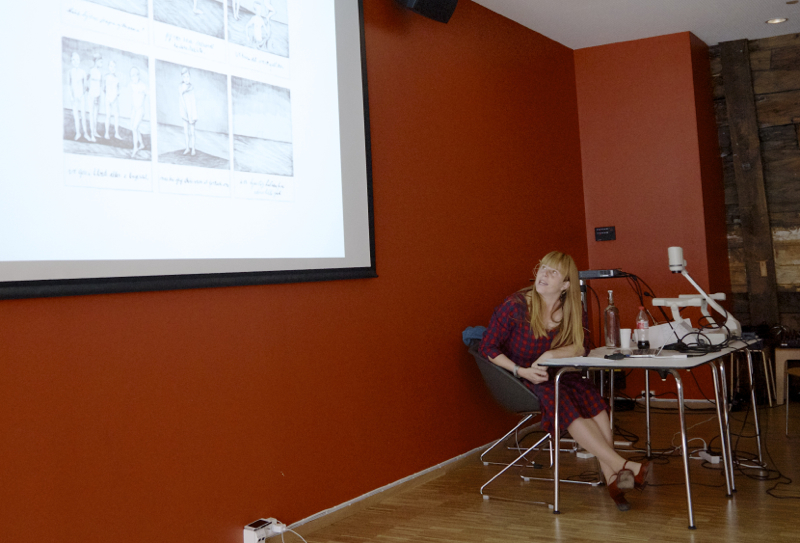 He talked about his drawing process, visual style and inspirations, and “borrowing” from other artists. By the way, Mark Crilley already have a vast collection of How to draw-videos on his YouTube channel; which is a nifty resource for anyone interested in learning to draw. 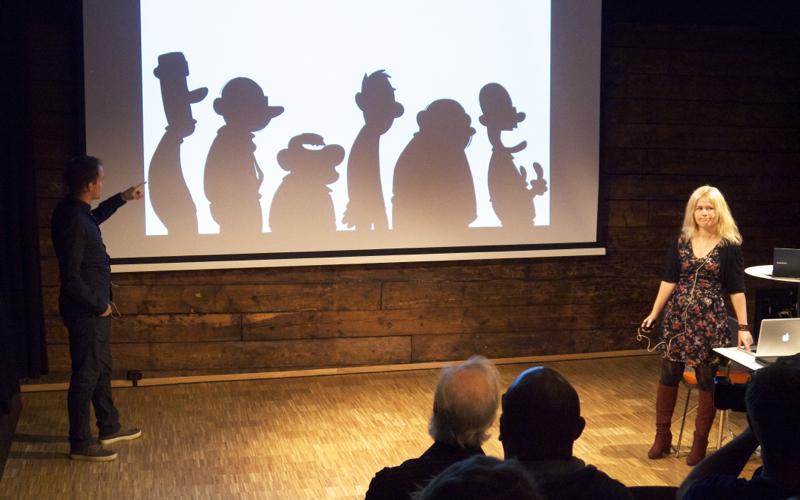 I also attended Thierry Capezzone’s talk about Flåklypa, which is yet another Norwegian Christmas comic. 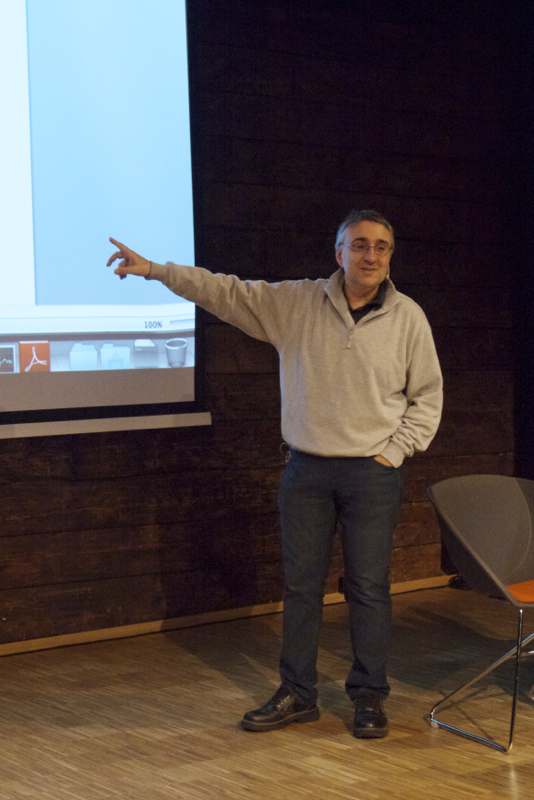 He talked about how he had to distance himself from his own Franco-Belgian drawing style on this project. This was important because a lot of Norwegian would have certain expectations about the look of a comic set in the Flåklypa universe (originally created by renowned Norwegian artist Kjell Aukrust). 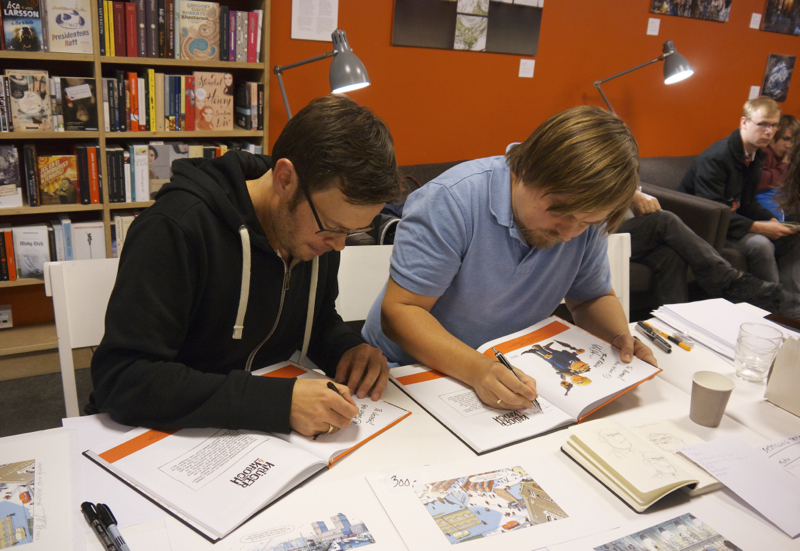 Also, he pointed out that he had only had three months to complete the entire comic, which in itself is an impressive feat. Last but not least, I attended the Grapple Seed presentation. The two guys behind this brilliant story had a thorough presentation of the premise of the world the comic is set in; a world where everything but stone is pushed away from the earth by an opposite grativational force. 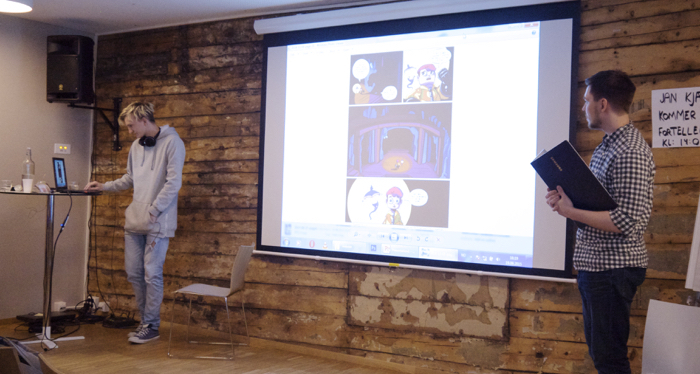 They also pointed out that it’s not just a webcomic; the comic is being made with print in mind. Sadly, none of the publishing companies they’d been in touch with had given a positive response (or worse, no response at all). This is a comic I would like more people to read, mainly because of its vivid art style and meticulously crafted alternative universe… So, I highly recommend taking a peek at Grappleseed. After these talks, I wandered around the convention and bought myself a few comics. 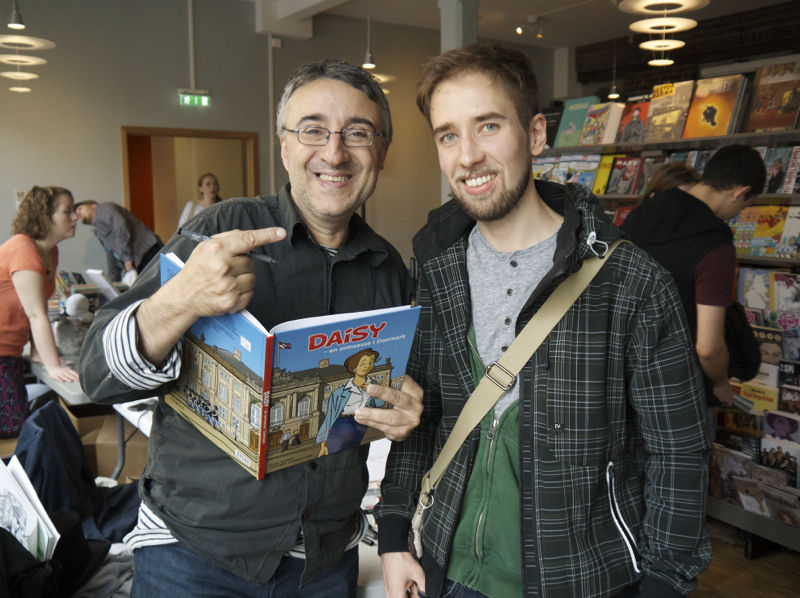 I also got to talk to Mark Crilley while he signed my copies of Brody’s Ghost volume 1 and volume 6. I also bought Jens K. Styve’s new book, and bothered him to sign my “artists I met at Raptus” book (a Moleskine sketchbook I’ve been collecting autographs and drawings in since 2011). He recognized the brand with a smile. I told him that I’m finding it hard to use my own Moleskine sketchbook, just because it’s so expensive (I’ve used about 1/3 of the pages, and I got it many years ago!). I had to skip most of the events on this day, since I was very pressed for time on a project I have to finish. This was particularly sad because I had looked forward to Mark Crilley’s talk about his Mastering Manga books (and of course, I wanted him to draw in the aforementioned autograph book). But perhaps I’ll have another chance someday? Nevertheless, I decided that I should at least go to the final event of the day, The Big Show. This is also marks the end of the festival. 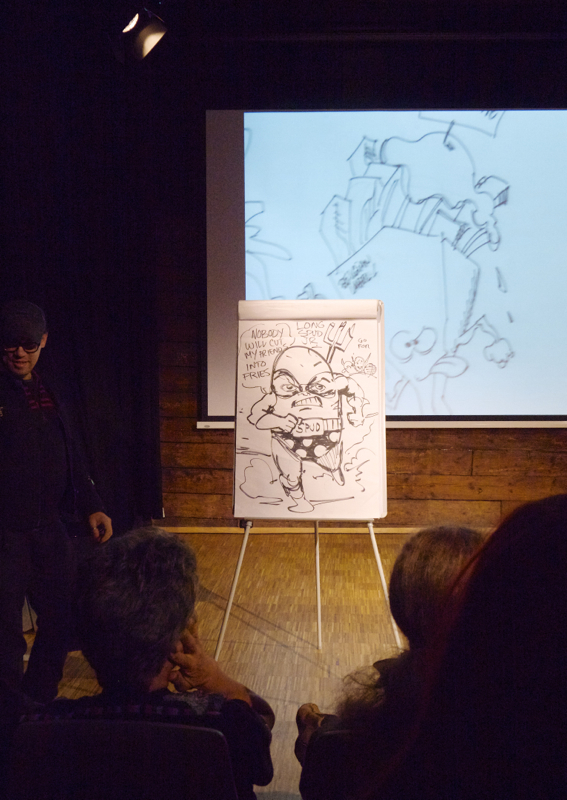 During the show, which follows a formula from past festivals, the artist guests performed live drawing on stage. The event was fun to watch, and there were a lot of people in attendance. The artists were prompted to draw english idioms, which were kept secret so that people could guess what they were. All in all, basically a big game of pictionary. 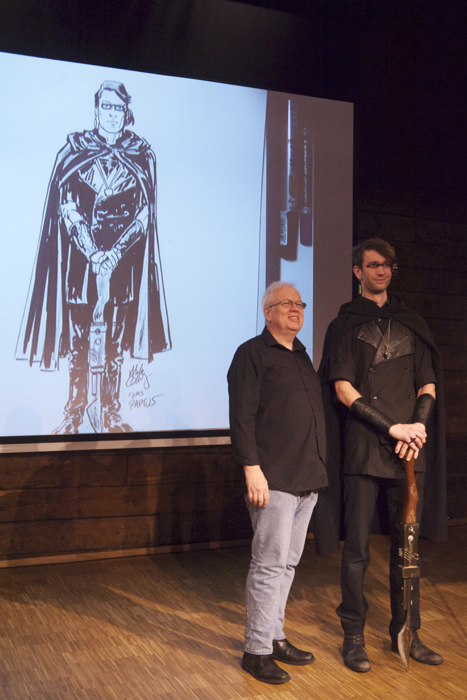 Furthermore, the winner of the Cosplay Contest for costumes had his likeness drawn by Mike Collins on the big screen during the show. Big rounds of applause were given to all of the artists during and at the end of the event. It was also announced that next year’s Raptus will be held on September 16th to 18th. That’s it for this year! If you’ve written about Raptus on your blog, I would love to read it! Leave a link below, or send me a tweet @InvPaperclip. PS: I refer to the traditional Norwegian Christmas comics a couple of times in this post… I wrote a personal tidbit about this particular phenomena a while ago: Traditional Christmas comics. 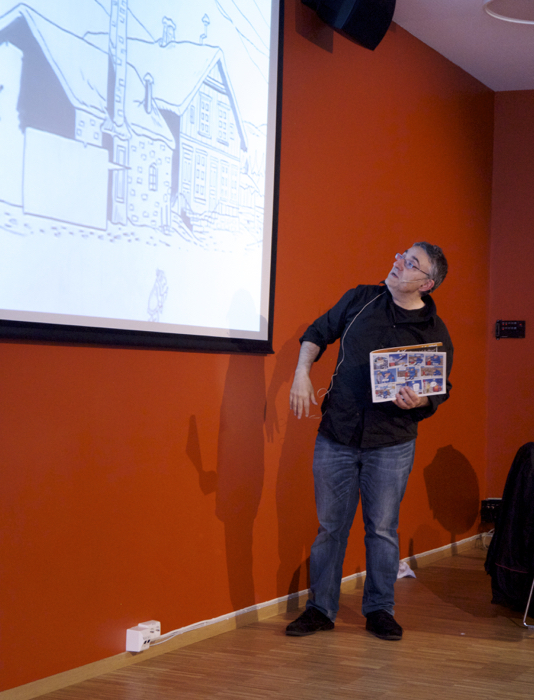 I made some comics on Sunday, February 1st… and so did a lot of other people. 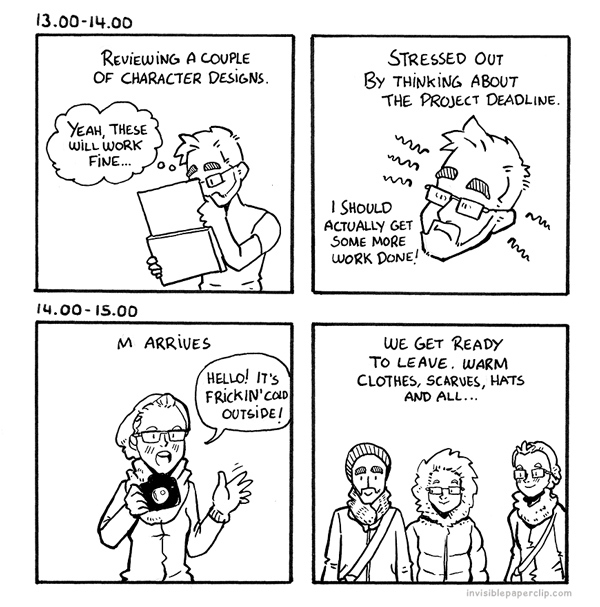 If you’re wondering why, you can read about Hourly Comic Day here (not to be confused with 24 Hour Comic Day, which is also explained). 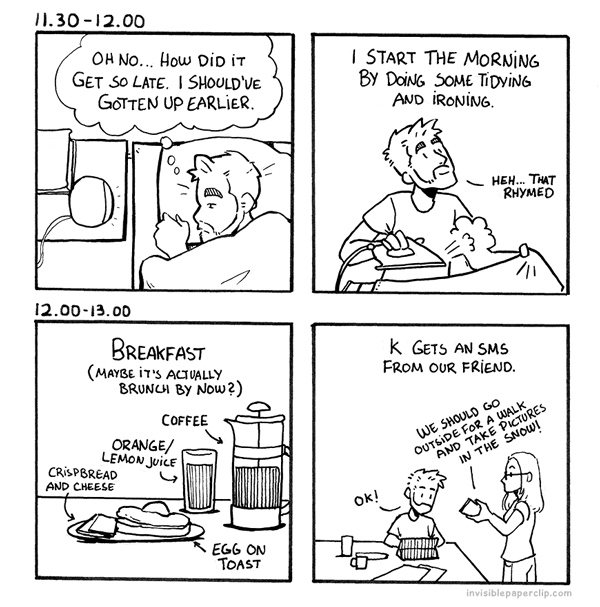 In short, everyone goes about their day as usual, and every hour they document something that happened during that hour in one or more comic panels. 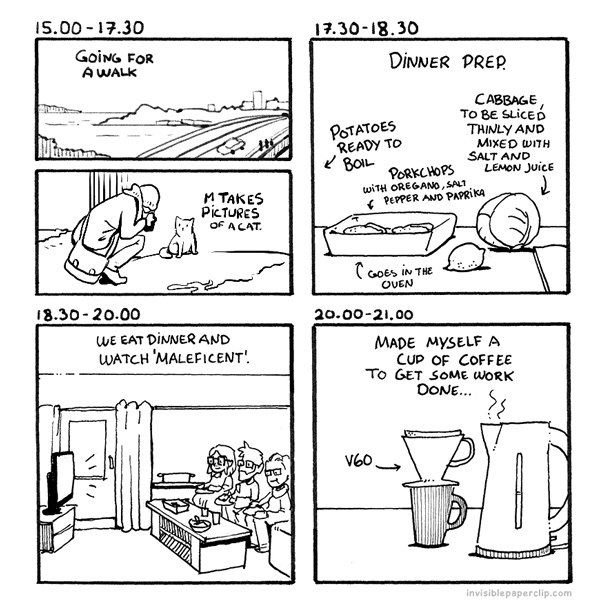 Sarah McIntyre (illustrator and writer) also wrote about HCD here, and she provides some great examples of her own hourly comics. If there’s one thing to earn from doing this annual “experiment”, it’s the sense of community one gets from participating. 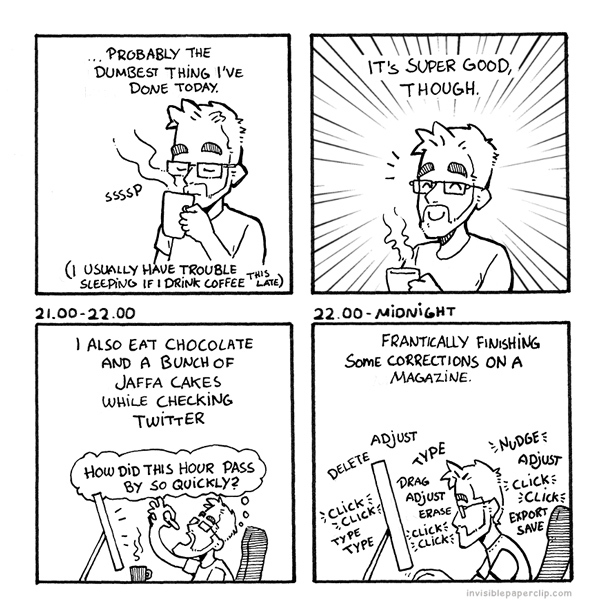 As an added bonus, there’s a lot of fun hourly comics to read, especially on Twitter with the hashtag #HourlyComicDay. 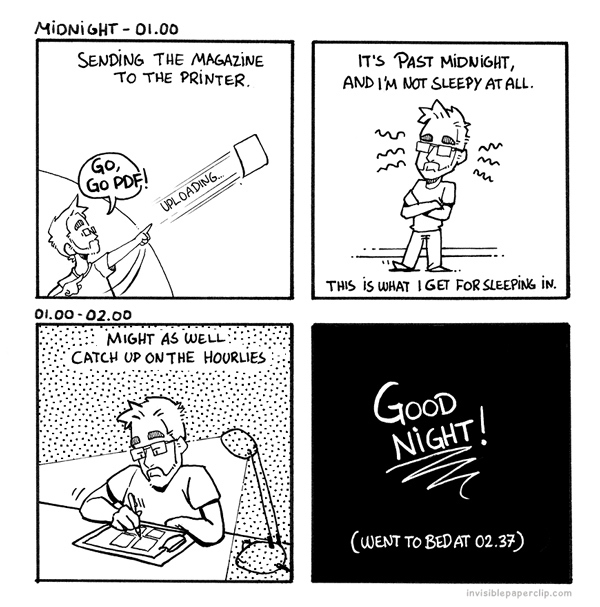 Sadly, I had to cheat a little bit with the timestamps on my comics, since I discovered today that I actually had skipped some of the hours. I had also left a panel blank, so I split that in two and drew those digitally. I also inked most of the comic yesterday and today, so I can’t say that I made all this in one day. Still, I’ve improved since last year (2014), and the year before (2013). Anyway, enjoy! And please leave a comment with a link to your own hourly comics if you made some (ok, you don’t have to… but it would be awesome if you did). 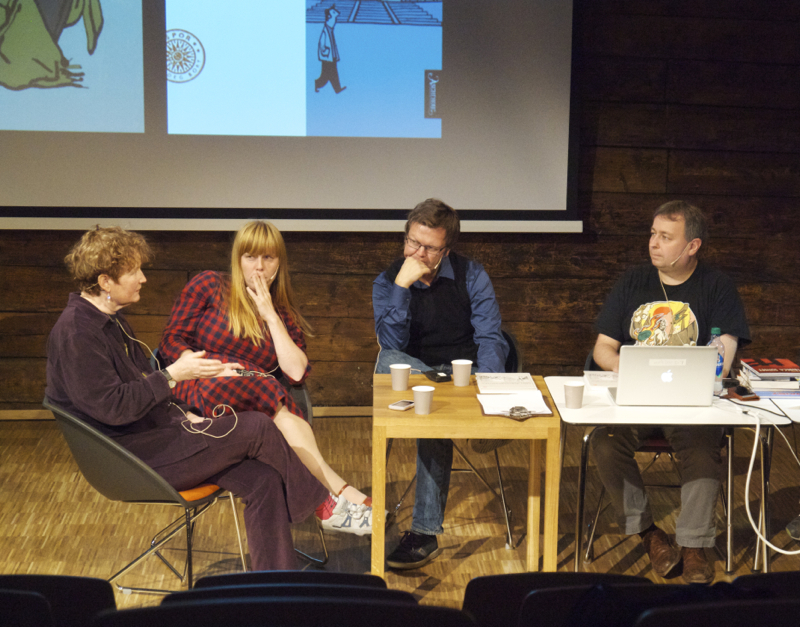 Joe Decie, Dan Berry, Audra Furuichi, Alisa Harris, Sarah McIntyre, Boum. Whether the quote is true or not, this was something that stuck with me after I had watched the first episode of Topic Town. Topic Town is an ongoing video series and talkshow created by Craig Benzine (also known as Wheezywaiter) and Matt Weber. In each episode, the two guys spend somewhere around ten minutes talking about a more-or-less random topic. It’s currently hosted on The Good Stuff on YouTube. I drew this using screengrabs from the first video and tracing paper. The text is lettered by hand, based on Helvetica Neue UltraLight and Thin Italic. After coloring the drawing with some of Kyle’s watercolor brushes, I animated it and tweeted the final product to @wheezywaiter. It so happened that he immediately started using the drawing as a logo (or intro graphic) for the show. This, of course, makes me a happy artist! Oh, and here’s the latest installment of Topic Town…well, at least at the time I’m posting this.